Does My Travel Insurance Cover Me in a Country With a Travel Advisory? While no one can predict the future, there are many things you can do to be more informed and proactive to ensure your safety while you are travelling. It is vital to check for travel advisories for your specific destination before booking your trip and a few days before leaving by going to https://travel.gc.ca/travelling/advisories. This is Canada’s official source of destination-specific travel information. What is a travel advisory and why is it important? natural hazards and climate issues like earthquakes or hurricanes. Advice and safety precautions provided by the Canadian government help you analyze the risk of travelling to your planned destination so you’re better prepared for your trip. The two highest risk levels, “avoid non-essential travel” and “avoid all travel,” should be taken seriously—they suggest major concerns for tourists. Travel medical insurance policies have exclusions when it comes to travelling in risky countries. It’s important to know how your travel insurance policy will cover you, so you can travel more confidently. As described by the Government of Canada, the two highest risk levels of travel advisories — “avoid non-essential travel” and “avoid all travel” — can affect your travel insurance coverage, depending on when the travel advisory comes into effect. the sickness or injury-related expenses are unconnected to the reason for the travel advisory. If the travel advisory is issued after the date you leave for your trip, your travel medical insurance policy will cover you normally for any unforeseen event. Google Alerts will inform you of any important political events or natural disasters in the time leading up to your departure and during your trip. You can use keywords like ‘destination + travel’ or ‘Canadian travel advisory’ for a specific location. Keep your loved ones at home informed of your travel plans and print them a copy of your travel itinerary, including the contact details for your hotel and travel insurance provider in case they need to reach you. Carry your ID and passport with you at all times. You should also keep your travel insurance information card in your wallet to help you in case of any accidents or injuries. Create back-up documents by scanning important information and emailing the files to yourself in case of theft or loss. This Information Card can be printed to credit card size (try printing it at 30% size), folded and put into your wallet. Whether you’re travelling to the U.S. or anywhere outside of North America, it’s always a good idea to have Canadian Consulate contact information for the country you are going to. 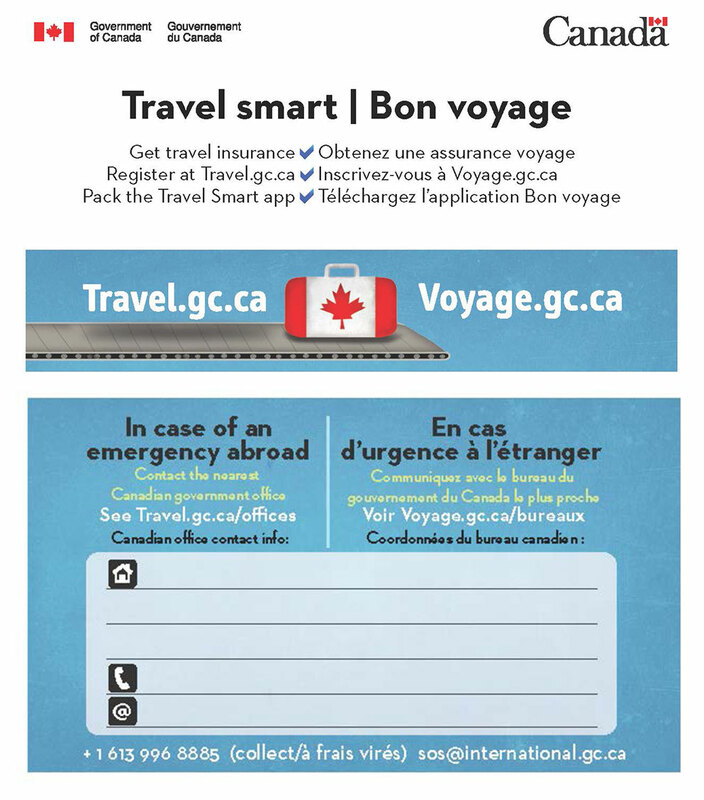 The Canadian consular services help travellers abroad with a number of medical emergencies, legal issues, lost or stolen passports and contacting friends or relatives back home. You can also email [email protected], call directly at 1-613-996-8885, or text 1-613-209-1233. At SBIS we can help you select travel medical insurance coverage that fits your plans and budget. Call us today for good advice.